Lego’s Architecture series gives adult fans the perfect excuse to keep buying the building toy—because they appreciate the design of the buildings, not because they secretly wanted to build spaceships. And while the new Lego Big Ben isn’t officially part of the Architecture line, at 23-inches tall it’s still an impressively-detailed recreation. 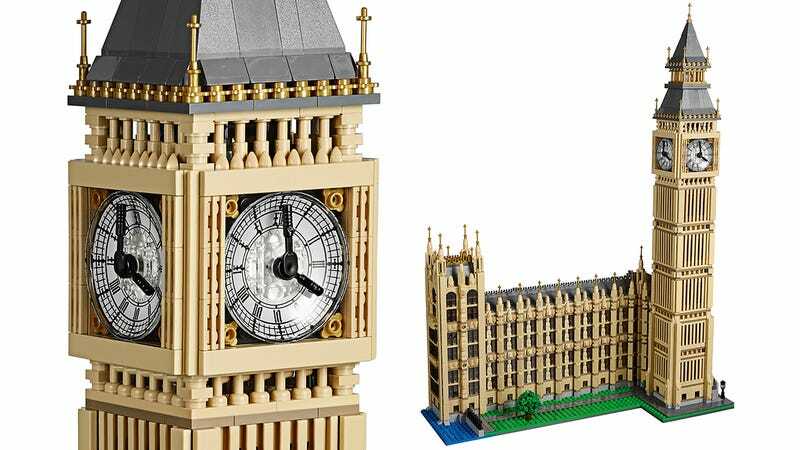 Assembled from over 4,000 pieces, the new set, which will be available starting on July 1 for $250, recreates part of Westminster Palace, including its iconic Elizabeth Tower on the end with Big Ben up top, still ticking away over London after 157 years. Unfortunately this miniature version of Big Ben doesn’t actually tick, tock, or keep time. However, the back of the set’s packaging reveals that the model does use some simple Technics gearing on the inside to allow all four of its clock faces to be adjusted at the same time using a single dial on the back, ensuring they’ll always remain in perfect unison. The top of the Elizabeth Tower can also be removed revealing an equally tiny version of Big Ben’s bell behind the clock faces. But disappointingly, a matching Minifig version of the royal family is an obvious glaring omission here. Come on, Lego, at least give us a Minifig Queen Elizabeth II to rule over our Lego cities.